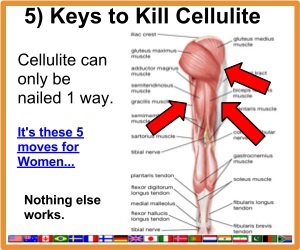 Cellulite is a collection of fats and proteins that forms in the lower part of the body. This gives areas such as the buttocks and thighs a dimpled and lumpy appearance. According to a report in Medical News Today, several factors play a big role in the development of cellulite. These include lifestyle, hormonal imbalances, clothing, genetics and especially diet. One problem that makes it hard to get rid of cellulite is the presence of weak connective tissue. The good news is you can strengthen your body’s connective tissue by including sunflower seeds in your anti cellulite diet. They contain vitamins B6 and E, selenium, and zinc. Vitamin B6 acts as a diuretic to help the body lose excess water that might make cellulite more visible. It also helps strengthen connective tissues. The good old pineapple should be part of your anti cellulite diet. To start with, it contains bromelain — a key element that inhibits the buildup of fibrin inside small blood vessels. As a result, it improves circulation in the body. Remember one of the causes of cellulite buildup is poor circulation especially in lower parts of the body. The problem with bromelain is it is widely concentrated in pineapple stems — a part that most people throw away. Make sure you eat the stem to get as much bromelain as possible. Broccoli is a vegetable that many people take for granted. However, it is a great anti cellulite food because it is rich in lipoic acid, which plays a big role in preventing collagen hardening. Broccoli is also a good source of dietary fiber that makes one feel fuller. Finally, it is a rich source of calcium and vitamin C.
Green tea is widely used by people who would like to lose weight. You should also drink green tea regularly because it contains catechins that enhance the oxidation of fat as well as increase the body’s energy expenditure. This was proven through trial testing, according to a study carried out by the University of Maryland’s Medical Center. Green tea also contains polyphenols that neutralize free radicals. If you have never bought pears while at the grocery store, include them in your shopping list. This juicy fruit contains a substantial amount of iodine. Your body’s thyroid gland requires iodine to function well. Iodine also plays a key role in maintaining the basal metabolic rate at an optimum level. If your body does not have sufficient iodine, the thyroid gland will perform poorly leading to weight gain meaning you are likely to pack on more cellulite. Finally, iodine flushes out toxins from the body to keep you healthy. Brussels sprout is a cruciferous vegetable that contains indole 3 carbinol (I3C). The beauty with I3C is it breaks down into a liver enzyme called di indolyl methane (DIM). This enzyme inhibits the body’s production of hormones such as 16 OH that take part in the collagen break down process. Chili and cayenne peppers contain capsaicin — an ingredient that can shrink fat tissue as well as lower fat levels in blood. This is according to a study carried out by Jong Won Yun et al and published in the Journal of Proteome Research. Study results show that including chili and cayenne peppers in one’s anti cellulite diet leads to weight loss of about eight percent. Moreover, capsaicin alters at least 20 proteins found in fat making it easy for the body to break them down. Finally, capsaicin suppresses one’s appetite to eat. All of these aspects make it a good choice for someone who would like to get rid of cellulite. The avocado fruit is widely available in many parts of the world and has great anti cellulite qualities. Avocados contain healthy monounsaturated fatty acids (MUFA), phytochemicals, dietary fiber, and essential nutrients. According to a study published in the Nutrition Journal, avocados were incorporated into the diet of a large pool of individuals to determine their weight fluctuation against those whose diet did not incorporate this ingredient. All other dietary factors remained equal. Participants in the study who ate avocados did not gain weight and their waist circumference was significantly lower. Another study published in the Journal of Clinical Nutrition found that eating foods rich in monounsaturated fats such as avocados increases the body’s ability to burn more calories, which is good news for people struggling to remove cellulite. In fact, eating this fruit increases resting energy expenditure by up to 4.3 percent. If you combine eating avocados and some bit of exercise, you will definitely burn more calories. 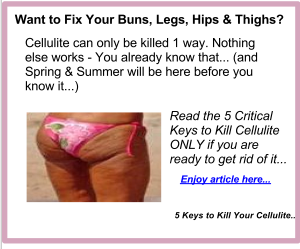 If you have cellulite and feel like there is nothing that you can do, do not lose hope. By eating the right foods, you can banish any unsightly marks from your body. The important thing is starting as soon as possible. So, don’t delay and be sure to add these ingredients to your shopping list on your next grocery store visit.